Are Morro Bay officials attempting to chip away at Measure D? A Morro Bay law popularly known as “Measure D” is once again under serious assault by city government. Measure D can be modified or removed from the municipal code only by a vote of the people. It appears that there is an attempt underway to circumvent the will of the people by “interpreting” Measure D to suit the agenda of one or more of Morro Bay’s elected officials. Voters agreed and the measure passed and became part of the Morro Bay Municipal Code. 2) “Interpret” the law in whatever way is necessary to support city government’s agenda. Measure D has been violated repeatedly using both of these approaches. “For purposes of illustration only, and not by way of limitation, no approval shall be granted for any new passenger for hire boats or supporting facilities, or for any new restaurant, café, gift shop or other retail establishments serving the general public, and any existing such uses shall hereafter be considered nonconforming and shall not be expanded or enlarged,” Measure D says. The meaning of these statements is very clear to most people. Yet, businesses in the Measure D area have illegally expanded and new businesses having little or nothing to do with fishing have appeared. This was done with full knowledge and support of city government. The most recent assault on Measure D comes in the form of a planning commission project, evidently chartered by elected officials, to come up with a new interpretation of the law. It appears to some residents that the push to reinterpret the measure is nothing more than a scheme to change the law without a vote of the people, with an ultimate goal of legitimizing existing and planned future violations. This attempt at an end run around the law has not gone unnoticed. On Aug. 16, the planning commission began discussions of Measure D. During public comment, all speakers supported the measure and several speakers made clear their displeasure with the city’s failure to respect the law. Morro Bay resident George Leage told the commissioners that there have been and are many violations of Measure D, and noted that they are not the fault of the business people. They are the fault of city government, which allowed the violations to occur. Discussions demonstrated a diversity of opinion. Staff and commissioner Tefft were adamant that the law was not clear. Commissioner Sadowski said it was very clear, and just needed to be enforced. Commissioner Ingraffia said the commission should be reading what is written, and not trying to read in things that are not there. He also appeared to suggest that the real issue underlying the situation might be a need or desire for more income from the lease sites. Revenues from the sites go to the harbor department. In the past, the city has been accused of illegally siphoning off income from these sites for other purposes. Money does seem to be at the root of the issue today. Many have long suspected that the city’s agenda is to weaken Measure D to pave the way for major development in the area that is supposed to be reserved for commercial fishing. Whether city government or the fishermen and their supporters will win this latest battle remains to be seen. It has been suggested that planning commission hearings, with the opportunity for public input, should be held before any contract negotiations take place. This might put a stop to violations of a law passed by the people to protect the town’s fishing industry. You are correct about one thing: Measure D should continue to be the law, and interpreted in the manner in which it has been as long as Morro Bay remains an incorporated city. Joe Giannini and Ed Ewing were both fine individuals with the best of intentions for Morro Bay. I’d still like to see it enforced a little better than it has been. Violations have been occurring for a number of years. That should be clear enough for ANYONE to understand. The intent of the measure, stated by its originators, is to stop further commercial development in the Measure D area until a vote of the people says something different. 1) If you don’t like the law, just ignore it, and 2) “Interpret” the law in whatever way is necessary to support city government’s agenda. They are learning from the top…. Since we’re talking about Morro Bay City government here…. That big survey (not the one that was in the water bills) is finished and online. It’s pretty obvious what the vast majority people of Morro Bay really want here. They want environmental green space, biking and walking paths. Other options are pretty far behind in the ratings. This should prove another interesting test to see if our City government cares what the people want, or if they will cater to special interests once again. The current City Council has done so much damage to what was once a very manageable city that unincorporation is just around the corner. 50 years of hard work, by caring citizens, have been destroyed by this council that others before them sacrificed so hard to achieve. It’s a very sad situation. The current Council has definitely NOT destroyed “50 years of hard work by caring citizens”. That’s nonsense. Unfortunately, however, they haven’t made things better, either. We seem to just have more of what we’ve always had. The names and faces change, but the quality of City government does not improve. In Morro Bay, we have a long and inglorious tradition of politicians who sought office purely for the opportunity to pursue their own personal agendas; namely doing favors for themselves and their cronies. For example, the last crew that was in there, headed by Yates, was very bad, and so were some of their senior staff. That bunch certainly didn’t care about the will of the people or the fate of the fishermen. They didn’t enforce Measure D. They allowed numerous gross violations, and that is only one example how they did special favors for their pals..
We had high hopes for the current bunch, but unfortunately, there is a big problem, and his name is Irons. Whether he started out bad, or let power go to his head is hard to say, but he is no better than his predecessor. Another problem is the seeming unwillingness of the Council members to stand up to this character. They appear to be honest, but weak. So, it’s the “same old same old” that has been going on for years.Consider the documented words of Measure D’s supporters back in 1981. It was all about cronyism and money then, and it’s the same now. Is there any hope of changing that? We’ll see. We have three people running for mayor. Whatever you think of their politics, I’d suggest voting for someone that you believe is honest and that you believe actually cares about the people of Morro Bay and what WE want. For me, that will not be the incumbent. 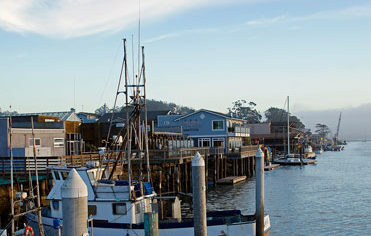 Morro Bay was incorporated to take advantage of the money coming from the power plant. Around 10 years ago, the same group of people who elected the current city council decided to fight the power plant. The City lost out on over 2 1/2 million guaranteed dollars annually from stopping the remodel of the plant. Add in the city council’s arbitrarily asking the California Coastal Commission to not vote on the waste water project, thereby increasing the costs, several times over the original cost, and any thinking person would realize that, financially, Morro Bay is lost. Add the money spent on managment, lawyers, consultants and we are 3 million dollars per year short of what we need to provide basic services. All the people who are only good at stopping things, congratulations! You have assured that we will be unincorporated at some time in the near future. Then we will have very little to say about what happens to our city. On May 4, 2010, the State Water Resources Control Board voted to put a stop to once-through-cooling, a very destructive process used by the Morro Bay power plant. The plants were given until 2015 to phase it out Dynegy decided it wasn’t worth it to them because the plant was already old and decrepit. If you don’t like the power plant closure, talk to the Water Board and Dynegy. Whether or not someone had asked the CCC to ban the WWTP from being on the beach, they would have done so when the permit application came up. All along the coast, communities are being forced to move infrastructure inland due to climate change and sea level rise. If you want to blame someone for that, try everybody who contributes to climate change. Wrong again! Moss Landing’s power plant remodel was proposed at the same time as Morro Bay’s. A small group of residents fought to stop this from happening in Morro Bay and managed to drag it until it was unallowable. Moss Landing is operating today. As far as the wastewater treatment facility, it’s nice to know that you can predict what would have happened had there been a vote. You must have an eight ball or something. The fact is that the day the California Coastal Commission was to vote on the project, after 9 years of expense to the Ctiy, Jamie Irons stood before the Commission and asked them to withdraw the project. This was completely at odds with what Cayucos wanted to do. We’ll never know what the vote would have been because they weren’t allowed to vote. They voiced their extreme displeasure at this meeting and Morro Bay lost Cayucos as a partner forever. The taxpayers of Morro Bay are paying dearly for the arrogance and nearsightedness of a few people. Linda, Linda, Linda..we have spoken on previous occasions and I appreciate your concerns for Morro Bay, but with regards to some of your comments, you appear to have consumed too much of the CAPE KOOL-AID. Please spend some time studying the history of the cycles of world climate change before you blame it on everything. ENTERTAINMENT and it’s potential and the associated remediation costs were the deciding factors in the abandonment of the plant upgrade. Clearly it was cheaper to find power elsewhere…and now the city is paying the price for their financial blunder….and so it goes. This City Council is NOT transparent. The last City Council was more transparent. keeping the citizens in the dark. Sounds just like the way the Constitution of the United States is being treated. Why are Irons and his comrades so intent on destroying the charm, the character, and the history of this very unique central coast seaport town? Why you ask. Money of course. Yes Irons and comrades are on their way to destroy MB charm and character. We need to vote them out especially Irons. Alas, I think you’re right, but I think the main culprit is Irons – who, by the way, I think is under the spell of our “friend” Gibson – the likely “head of the snake”.. What I don’t understand is why the Council doesn’t refuse to go along with him. I will say that we need to look a lot harder at candidates in the future and make sure they are not controlled by the developers. Development never pays for itself. It ends up being a drain on the resources of the governments that have to service it. It won’t solve our budget problems. It will make them worse. One of those “evil ” developers built the house you live in. There were 18 new building permits in Morro Bay last year for single family homes. In Morro Bay, overdevelopment is not the problem! When Morro Bay disincorporates and the county takes over, will Measure D even be enforceable? Since when has local government ever cared about the “Will of the people”? Good point, but if we don’t keep pushing back, things will be even worse. I hope I’m not violating any CCN rules here, but I’d like to share a link to an article written years ago by the late newsman Jack McCurdy. It was most recently published in the SLO Coast Journal, which is no longer publishing news, but remains online. In this article, Jack describes some of the awful things that would have happened to Morro Bay if people hadn’t fought back against the politicians who were bent on destroying Morro Bay for financial gain. What you describe as “awful things” would have allowed Morro Bay to continue to exist as an incorporated city.